Friday evening’s tilt was against the Ottawa Gee-Gees, a team that had dampened the playoff hopes the week earlier. The game hadn’t even started and head coach Les Lawton’s Stingers were assessed a penalty for delay of game for coming out four seconds late. Twenty-eight seconds later, the Gee-Gees took advantage of the early power-play. 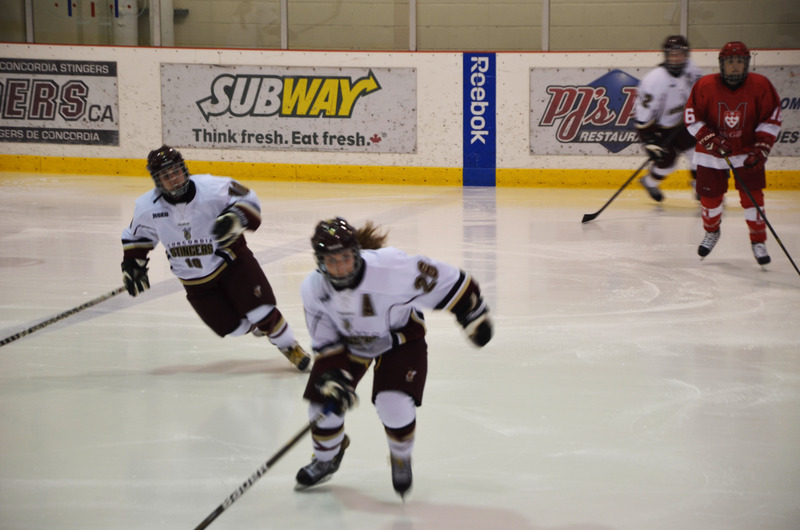 Defender Genevieve Legault wired a shot from the slot past Concordia goaltender Carolanne Lavoie-Pilon. Over a minute after the Gee-Gees’ goal, Stingers defender Margaret Hotte was sent to the sin bin for the first time in the game. The Gee-Gees once again took advantage, as Alicia Blomberg placed her stick at the perfect spot and deflected a Valerie Watson point shot to increase Ottawa’s lead to two. By the end of the period, the Gee-Gees added a third goal, this time by Asha Kauffeldt. In the second period, the Stingers seemed to regain composure and battled hard to create chances. Head coach Lawton reunited his old top line composed of Emilie Bocchia, Veronique Laramee-Paquette and Alyssa Sherrard after forward Erin Lally sat the game out after getting over the flu. The top line got Concordia on the scoresheet when Bocchia scored on a swift wrist shot taken from just inside the slot, with assists to Laramee-Paquette and Sherrard. With just under two to play in the period Stingers defender Gabrielle Meilleur, who was in the penalty box, skated out and was fed a stretch pass giving her a breakaway on the Ottawa goaltender. Her strong shot was turned aside. The third continued to be a battle between both sides, each exchanging a single penalty and both goalies standing their ground. In the end, the Stingers came up short, losing 3-1, with the shots even at 31 apiece. On Saturday afternoon the Stingers had a matinée affair with their cross-town rivals, the McGill Martlets. Before the puck dropped, there was an emotional sendoff to four members of the Concordia Stingers who were playing in their final home game of their Stinger careers; Bocchia, Laramee-Paquette, captain Mallory Lawton and defender Laurie Proulx-Duperre. The Stingers killed off two early penalties, but it wasn’t until the third penalty did McGill finally get a tally. Katia Clement-Hydra got her first of four goals on the afternoon. The second period showed good poise for Concordia when they were able to kill off a four-minute power play, including two of those minutes when they were two down. McGill doubled their lead courtesy of a penalty shot. Clement-Hydra pulled off a triple deke, which dragged Lavoie-Pilon out of position, and easily scored. The Martlets would add three more in the third and put the game out of hand at 5-0. A few of the veterans ending their career shared some of their insights following the emotional game. Following the game, the Concordia Stingers women’s hockey program were very pleased to announce the signing of Kelowna-born, current Dawson Blue forward Jesse Keca, who will join the roster next season. Keca was invited to the Under-18 Canadian National team. She is also a national team speed skater. Concordia will play their second-to-last game of the season this Saturday against the Carleton Ravens at Ice House Arena. The game starts at 7 p.m. and is available on SSN.